Plasticine is a form of modelling clay. Although normally associated with children, this material is useful in the initial stages of design, when quick model making is important. It can be shaped / moulded by hand and reused. Plasticine comes in a range of colours. Art straws are ideal for making model structures . They are supplied in a range of colours, shapes and sizes and can be glued or taped together. 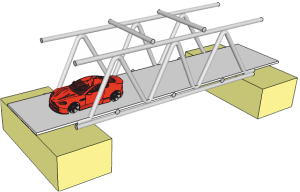 A good example of a model made from art straws, is a model bridge. Coloured card is supplied in a range of colours, shades and thicknesses. Card that has different colours on the front and back surfaces can even be bought. It is suitable for colourful models, especially the early stages of making a series of models. A good example of card as a modelling material, is in the manufacture of a prototype board game. Corrugated card is quite thick and relatively strong. It is used for the manufacture of initial / rough models, as it can be cut and shaped easily and is relatively cheap. It can be salvaged from cardboard boxes and sellotaped together to form models. 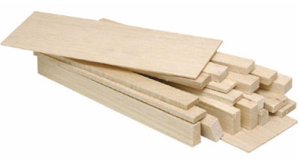 Foam boards are lightweight and easy to cut and shape. It is ideal for model making, although foam board can be relatively expensive. Card clad foam board is - foam with thick card applied to either surface. It can be cut and shaped easily, using hand tools and light equipment such as fretsaws. Balsa wood is a traditional model making material. Ideal for model making. Although classified as a hardwood, it is very soft and easy to cut and shape. However, it is easily broken or snapped and therefore great care is needed when cutting and shaping. It can be painted with water based paints and even varnished. Styrofoam is an excellent model making material. It is very light and easy to cut and shape, using a hot wire cutter. It can also be shaped with hand tools and files. It can be painted using water based paints (emulsion paints) giving a really good finish. Using styrofoam requires patience, as it can ‘crumble’ at the edges if care is not taken. High Density Polystyrene, also known as compressed polystyrene, is ideal for model making due to its physical properties. It can be cut and shaped quite easily with fretsaws and even hand tools. It is supplied in a range of colours, shades and thicknesses. This type of materials is used for vacuum forming, although it is suitable for model making. 1. How could plasticine be used in the initial stages of the design and development of a product? 2. Describe one way in which art straws are used for modelling. 3. Corrugated card is a versatile modelling material. Explain why this is the case. In your answer, describe the type of model that it can be used to make. 4. What are the advantages of using card clad foam board as a modelling material? 5. 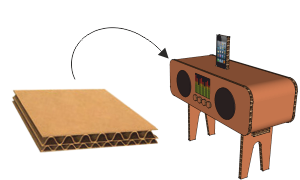 Why is balsa wood useful as a modelling material? 6. What are the physical properties of styrofoam, that make it suitable for modelling? Include in your answer, a description of the type of model that could be made from this material. 7. Why is modelling a very important aspect of the design process?